Location: At the end of McWhorter Drive, Skidaway Island, 17 miles south of Savannah, across from the University of Georgia Marine Education Center and Aquarium. Directions to the Library. Library Schedule: Please contact (912) 598-2474. 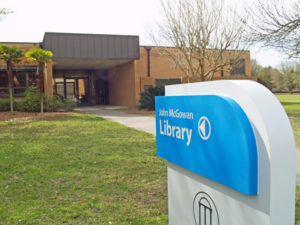 The John McGowan Library at UGA Skidaway Institute of Oceanography is the largest in the state devoted almost exclusively to marine science. The 6,100 square foot facility contains holdings of 4,000 book volumes and 17,000 serial volumes. The library subscribes to over 110 journals covering the spectrum of the ocean sciences. Researchers have access to the complete spectrum of more than 300 databases and full-text resources available through the state’s GALILEO internet network. In addition, the library has a large 70-seat auditorium which is used for lectures and meetings. The library serves as a unique resource for the entire University System of Georgia. For example, faculty and graduate students from the University of Georgia, Georgia State University, Georgia Tech, and Georgia Southern University regularly use the library in their research efforts. The facility has proven to be especially beneficial to undergraduate students in the marine biology program at Savannah State University and the biology and chemistry programs at Armstrong Atlantic State University. Students and faculty from all University System colleges and universities may check out books from the library. 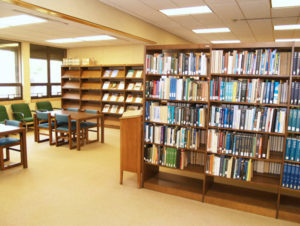 Not only is the library valued as a state-wide academic resource, it is also noted as a unique source of information to the public. The librarian provides assistance to high school students throughout the state who are working on science fair projects and to teachers creating units for their classes. As an associate library of NOAA (National Oceanic and Atmospheric Administration) network, the library also serves the scientists who manage the Gray’s Reef National Marine Sanctuary, a NOAA project housed on the Skidaway campus. As a branch library of the University of Georgia Libraries, this library’s holdings are entered on OCLC as part of the University of Georgia’s holdings under the symbol GUA. Since this branch library does not directly participate in the OCLC ILL subsystem as a separate unit, loans are best facilitated by ALA paper form, which may be transmitted by Fax to speed processing. Funding for the library is provided by the UGA Skidaway Institute of Oceanography and the University of Georgia Libraries.